Notes: A rare Red Data Book species, on high moorland and in the mountains, at altitudes of 650-1050 m, in the Scottish Highlands, and down to sea level in the Hebrides and Shetland. Unlikely to be recorded in Hampshire or on the Isle of Wight. Wingspan 26-32 mm. The moth is usually diurnal, but is recorded occasionally at light. 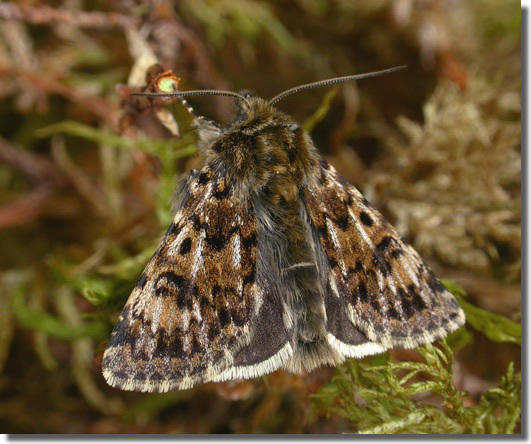 Larva feeds on Crowberry, Cowberry, Bilberry and Bearberry, over-wintering as a pupa.